8 Saul picked himself up off the ground, but when he opened his eyes he was blind. So his companions led him by the hand to Damascus. 9 He remained there blind for three days and did not eat or drink. The brilliant light from heaven illuminates this picture & casts shadows from right to left. Saul (Aka Paul from Acts 13 onwards) with hands raised to protect his eyes from the light. 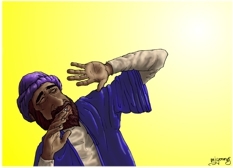 This picture was drawn for New Wine 2015 & shows Saul/Paul as the brilliant light from heaven (v3) shines down on him. I have kept the background very simple so as to focus attention on the figure of Saul/Paul.